Tapestry Solutions, a Boeing company, and RSAE Labs, a veteran-owned small business, recently demonstrated an advanced asset management solution for U.S. Navy officials that solves logistics challenges related to cargo tracking and monitoring. The solution demonstrated how the integration of software agents, wireless mesh networks and sensor devices can ensure total asset visibility – in open sky or indoor areas without GPS access. The Department of Defense uses ICODES for global movements of cargo across all modes of transportation – as represented in the photo above involving an SH-60 lifting a cargo pallet from a supply ship. The companies integrated Tapestry’s software technologies developed for military’s Integrated Computerized Deployment System (ICODES) with the automatic location and monitoring features of RSAE Labs’ mist® mesh network. ICODES is one of Tapestry’s premier software tools used for military deployment and distribution processes, including conveyance load-planning and yard management. It enables real-time collaborative planning and tracking of cargo for vessels, aircraft and railcars and provides a common operating picture across facilities. 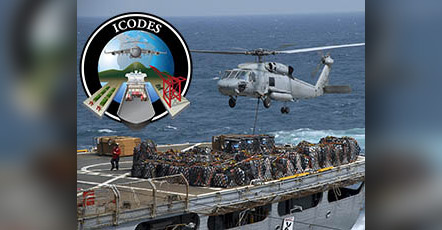 ICODES has been the Department of Defense’s vessel load planning system of record since 1997 and has served as its single load planning capability since 2007. Today, ICODES serves over 22,000 global users. RSAE Labs’ mist solution is an ultra-low power, self-healing mesh protocol that incorporates Automatic Identification Technology (AIT) devices, such as sensor tags, location beacons and network gateways. Unlike other AIT solutions limited to periodic manual or choke-point scans, mist can provide continuous end-to-end visibility of tagged assets in near real-time without the need for a fixed infrastructure. This enables regular position updates and timely sensor alerts for assets as they move through the supply chain. The demonstration validated that mist asset tags can reliably provide ICODES timely position information, enabling fast and accurate responses.